If you’re a musician or a singer, you’ll sooner or later face the task of creating a website for music or a singer website. For many of creative ones, this technical task seems rather intimidating. However, if you’re a burgeoning musician, the perspective of paying several thousand dollars for one of the best music websites with a custom design is also not the one to be fond of. Many musicians turned to me with a question of how to create music sites without breaking the bank. And today, I want to share with you a short step-by-step guidance on how to create best band websites and sites for musicians using website builder for musicians. Below, you’ll find the steps to follow to create a music website without painstaking efforts and overspending. 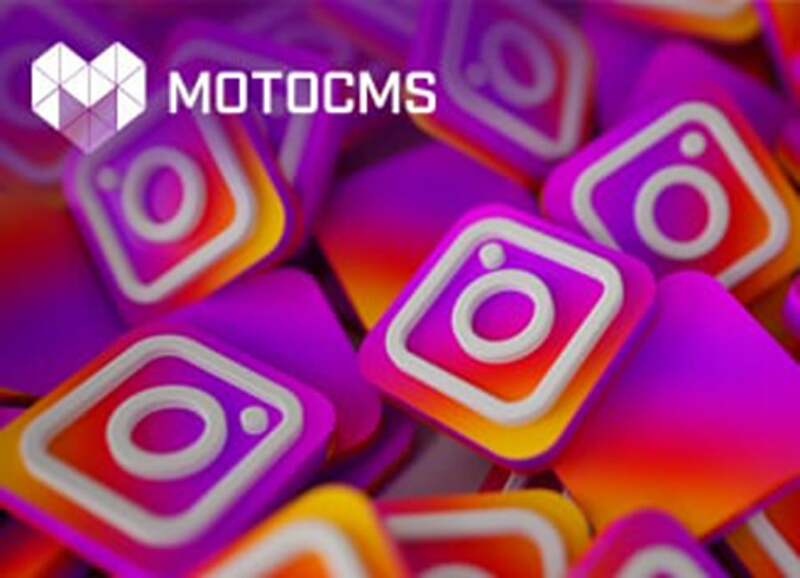 What’s more, you’ll also learn about modern music creating websites and MotoCMS website builder for musicians that makes creating music sites a real pleasure. So, let’s go! If you aim to create one of the best music websites, you should start small. You need a place for your website on a server. Needless to say, free servers won’t do. With them, you end up with low website loading speed and multiple issues related to your singer website security and stability. Don’t save on getting hosting from well-established hosting providers, as the prices they offer are not exuberant. I’m speaking about such providers as GoDaddy, BlueHost, HostGator, JustHost, iPage, etc. With these hosting providers, you get a powerful, secure hosting with all the tools needed for something like $5 – $10 per month. If you’re serious about running your website for music, I bet you can afford this. Fortunately, I’ve got an article for you that’ll help you with choosing the best host for your website. When you’re settled up with your hosting plan and domain name, you need to choose a music template that you can edit in WYSIWYG website builder for musicians. 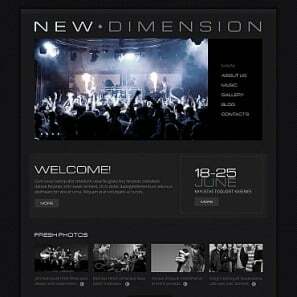 That’s the simplest way to create best music websites that’s suitable even for newbies in web design. Where to find such themes? Check out this collection of templates for music sites. All of them are compatible with MotoCMS website builder for musicians that will become your ultimate tool to hit the top with one of the best band websites or music sites you can ever create. 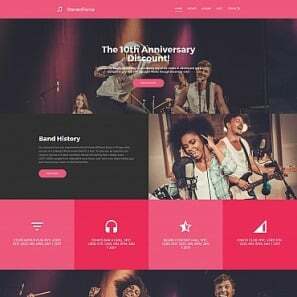 All the band, musician and singer website templates in this collection have ultra-modern designs and top-notch functionality to turn your website for music into a powerful multimedia platform with rich social integration options. These mobile-optimized artist website templates let you not only create a stunning website for your music but also reach cult following and engage new fans. This is possible thanks to newsletter subscription forms, social media widgets and social share buttons that support such popular social networks as Facebook, Instagram, Pinterest, etc. Let’s see a couple of examples. Sansar theme is perfect for creating sites for musicians that have power and confidence behind them. With Sansar, you can create your own music website with ease as the comprehensive MotoCMS website builder for musicians lets you add audio, video, imagery and widgets to your website in a manner of minutes. To make your life even simpler, Sansar theme comes with a number of prebuilt pages, so you don’t have to create them from scratch. 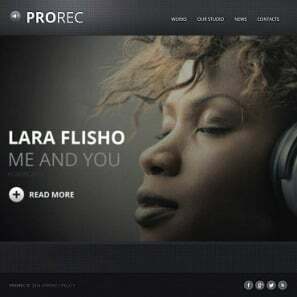 One more great example of a recording studio/singer website template that’s a pleasure to create a music website with. 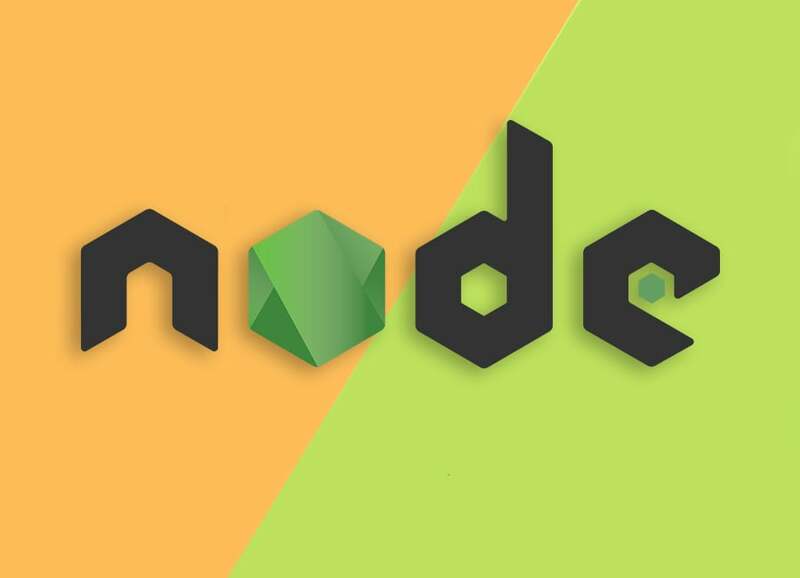 Recordex theme boasts of a vibrant neon color palette and razor-sharp Retina-ready imagery. It opens with a slider and music player, which immediately immerse website guests into what you do. Soft and delicate, this singer website is ideal for female singers/songwriters. 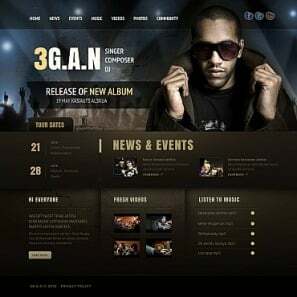 With it, you can create a stunning website for your music without going an extra mile, as the theme’s ultra-light design perfectly does its job. Enough of examples. I guess you got it. However, if you still have some doubts on how to choose a music template of your dreams, check out these 6 tips on choosing a proper template for your website. 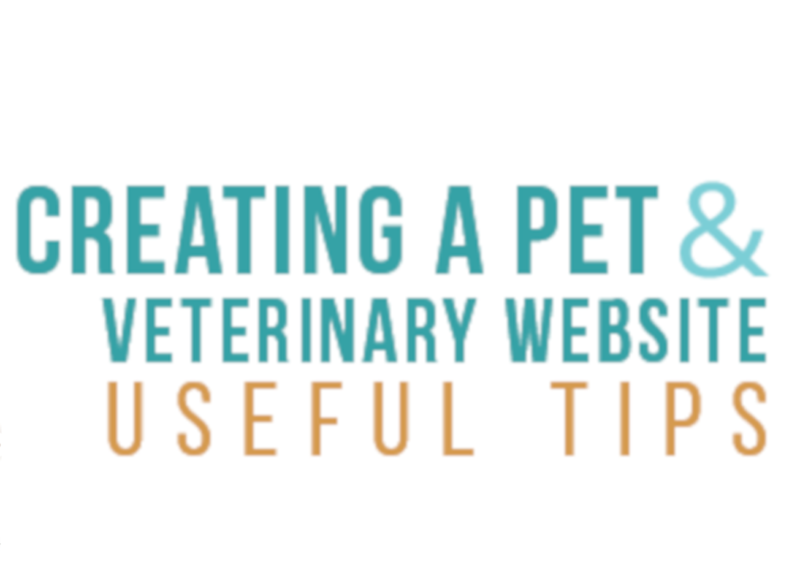 Firstly, establish your website identity: add your logo, chose a site name, enter a slogan. Add your details in website header/footer. Make changes to the color scheme of your website (if needed). Secondly, start working with pages: add blog content, tell more about your band and the music you play, add tour dates, etc. Thirdly, add media files. 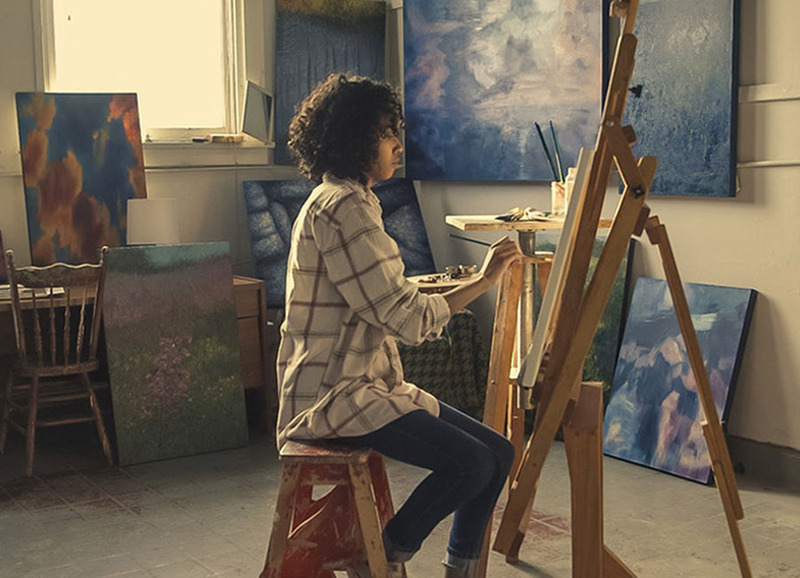 Upload your songs and customize music player, embed videos, add imagery and build you beautiful gallery page. Next, it’s time to make your site even more beautiful with interactive widgets. Multiple video, audio and social networking widgets will get you more fans within a short period of time. Then, connect your website to your accounts in social networks and set up social sharing buttons. Finally, enter your details for contact and subscribe forms. Set up a Google map. Basically, that’s all you have to do to create a stunning website for your music band with MotoCMS website builder for musicians. Feel free to be creative in the process as creativeness is the bread and butter for best band websites. Creating a music website is not that daunting as it may seem in the first place. You just need the right tools and the right mindset to accomplish this task within a short period of time. Follow the steps of website creation, listed in this post, use website builder for musicians, and you’re bound to end up with a jaw-dropping music website. I wish you good luck in this. Stay tuned!